As someone who has insatiable wanderlust, I am a huge fan of Dopes on the Road, whose founding editor, Meg Cale, chronicles her and her now wife Lindsay’s travel adventures throughout the world. Dopes on the Road has been a corner of internet paradise for me and many others, given that inclusive, diverse “LGBTQ” media is neither inclusive nor diverse, with many advertising dollars and sponsorships going towards cis gay men’s media, leaving few opportunities for others under the rainbow umbrella to survive and thrive. Many LGBTQ travel sites, similar to LGBTQ fashion sites, are not centered around identities outside of the cis white male – not centered around womyn, femmes, non-binary folks, and others who are viewed by mainstream industries as having little disposable income. Dopes on the Road has been my travel resource, a place where I see myself as a powerful femme, where I see my travel experiences reflected in another couple navigating the world outside normative gender experiences. That is why I was so honored when Meg reached out to me for wedding style advise. I gave her a few recommendations and made a few e-introductions to designers. Then, I waited patiently (actually, quite impatiently) to see the fruition of the couple’s carefully thought out wedding style planning. 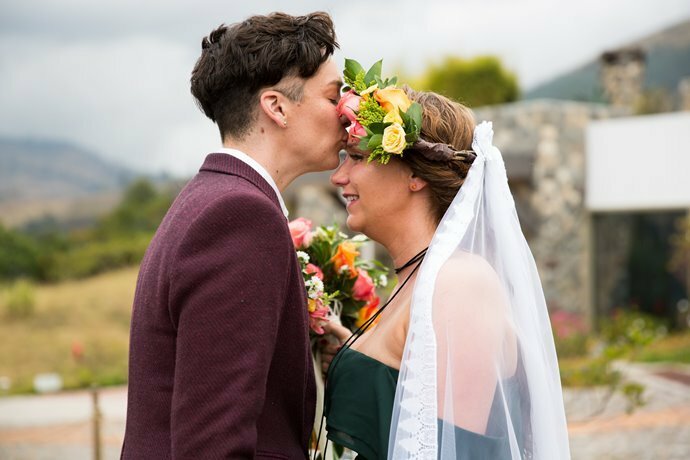 Meg and Lindsay have since married, and I have asked for them to share their love and style story with our readers so you too can maybe find some wedding inspiration in our small corner of queer fashion on the web. Congratulations to you both, from Anita Dolce Vita and all of dapperQ! Lindsay and I have been together for 4 years and got married on September 14, 2016. We met on a dating site when I was living in Brooklyn and she was living in Hummelstown, PA. Our lives couldn’t have been more different. I was skyscrapers and she was one stop light. Not long after we met I moved to South Korea and we started dating long distance. We’ve actually been apart for about the same amount of time as we’ve been in the same location. It’s an occupational hazard of my career as a travel writer. Lindsay came to visit me for three months while I was in Seoul and reluctantly fell in love with the lifestyle I’ve come to love. There was no proposal or epic engagement story. We actually just decided one night that we’d rather not be apart and knew that we’d live the rest of our lives together. It was as simple as a conversation. We spent 10 days backpacking around Ecuador and eloped at My Sacha Ji Wellness Hotel in the mountains of Otavalo, Ecuador. 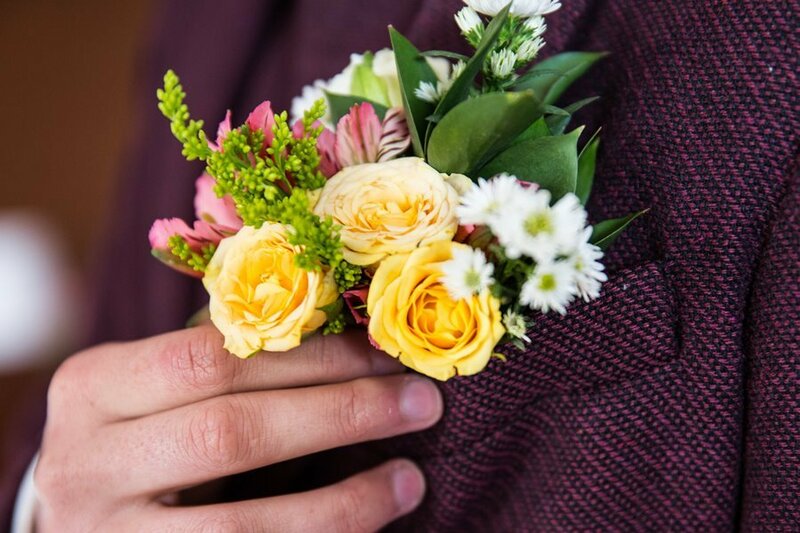 We wanted to emphasize the commitment we were making and prioritize quality time together over the details and expenses associated with a traditional wedding. 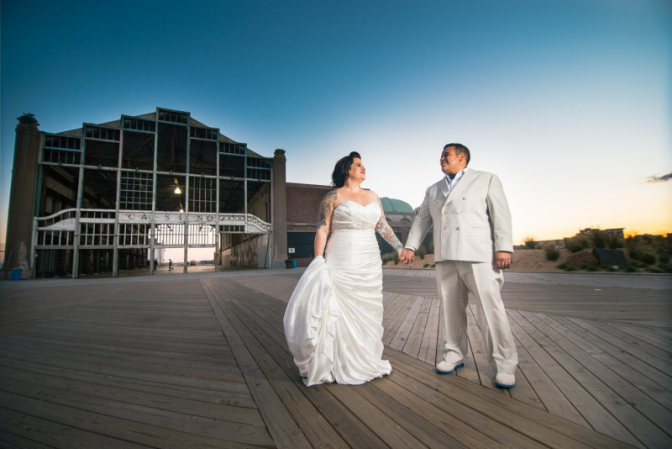 You can read more about our elopement here and here. 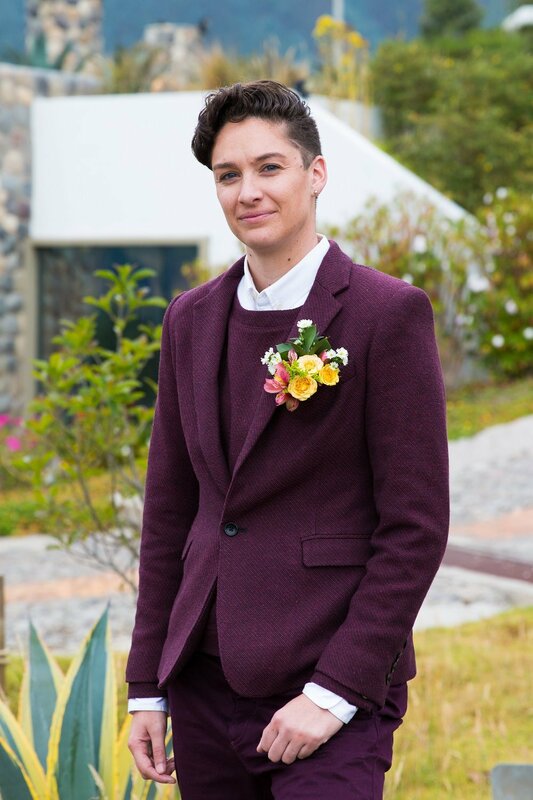 Lindsay selected Brave GentleMan for her wedding look because she fell in love with the androgynous euro-chic aesthetic and loved their commitment to sustainable fashion and labor friendly policies. 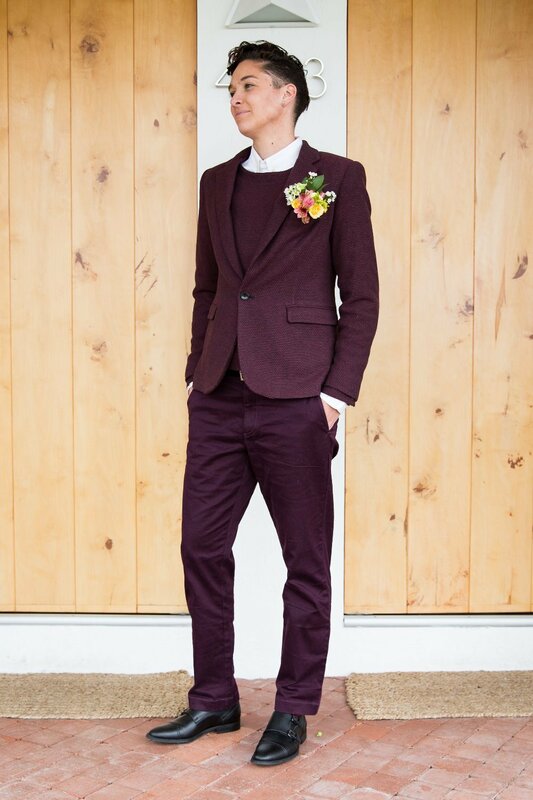 She selected their burgundy tweed suit and matching moto inspired side zip pullover that is made with future-wool tweed milled in Brazil with a blend of 100% recycled cotton and recycled poly. She paired the suit with the brand’s crisp White Armor Shirt and vegan leather double monk shoe dubbed “The Innovator”. Lindsay has small feet and struggles to find high quality androgynous footwear in her size. 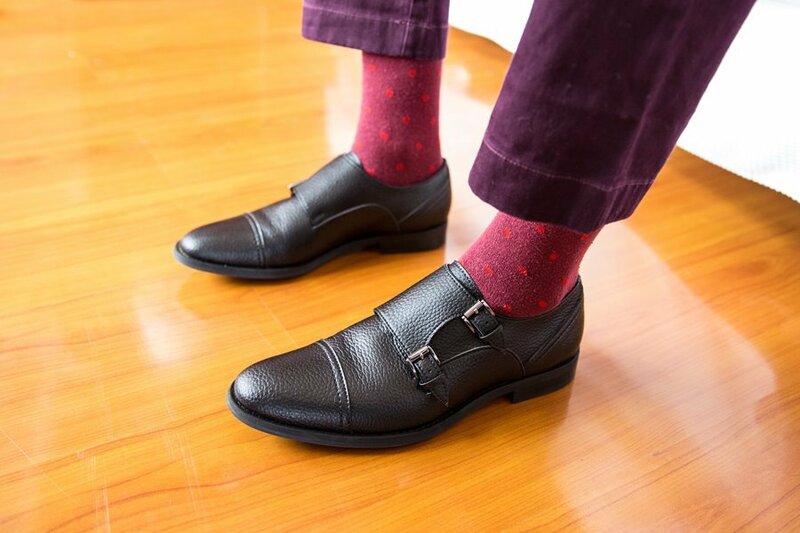 Brave GentleMan was a no brainer when we realized they specialized in smaller sizes. 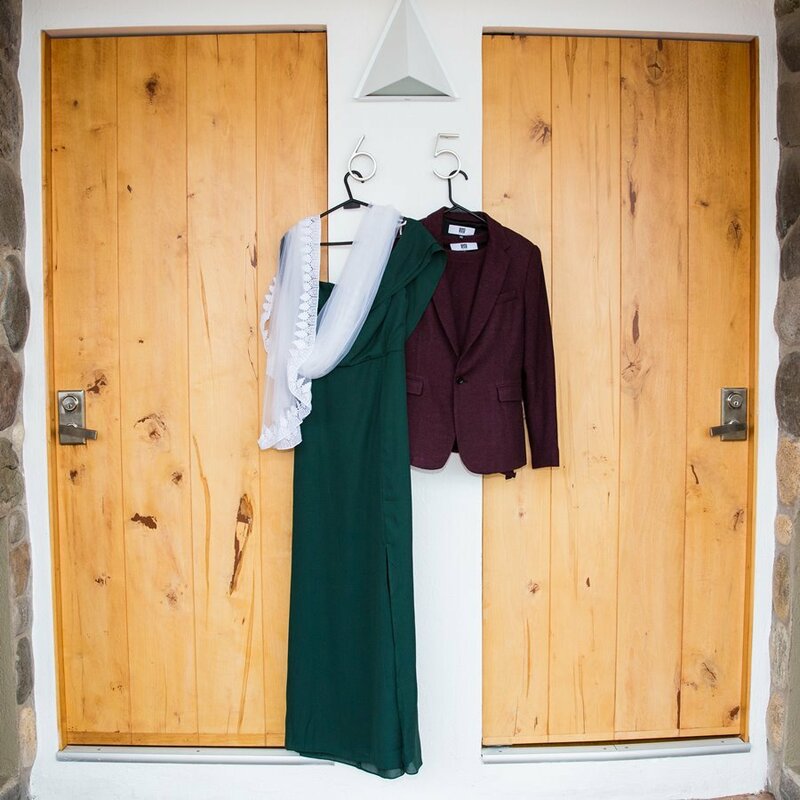 I wore a vintage hunter green full-length gown with a Bardot style neckline. 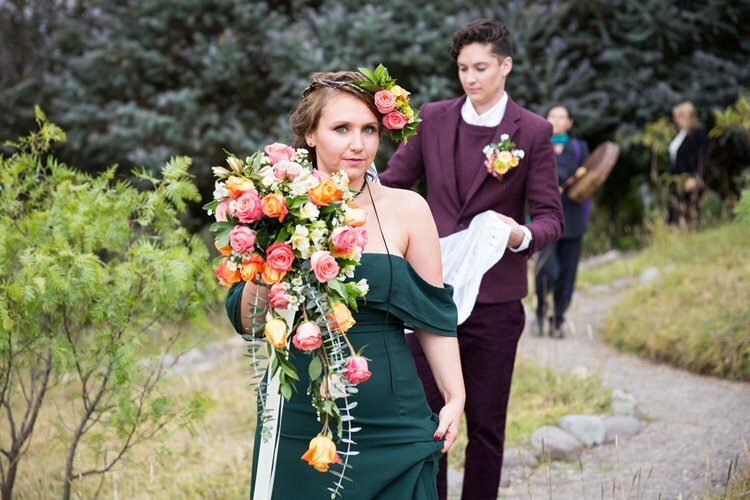 I paired the gown with a simple sandal and a handmade vegan leather cord as a necklace. 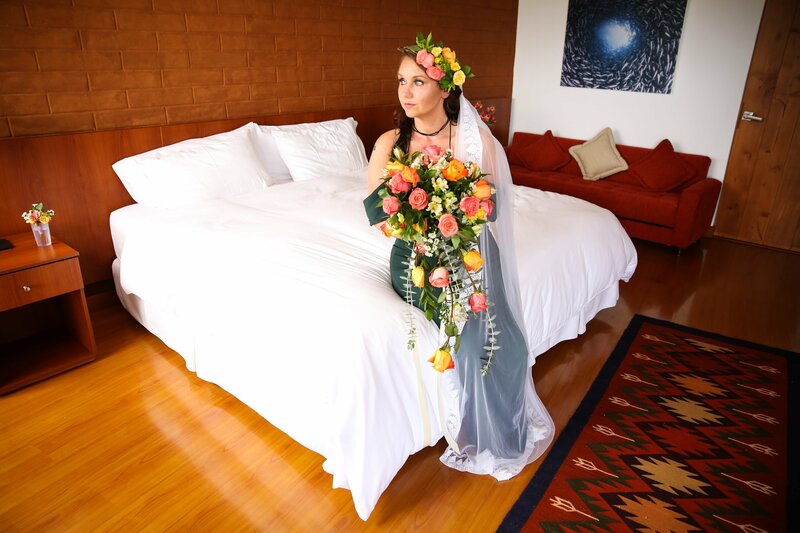 My flower crown and bouquet were created by an Ecuadorian florist using local Ecuadorian roses. For more information about LGBTQ travel in Ecuador, visit Dopes on the Road reviews here, here, here, and here. All images by Grace Chu.